Occasionally, a little bit of bleeding from your gums is normal when brushing or flossing your teeth. But if it happens regularly, you shouldn’t ignore the condition. Bleeding gums could be a symptom of a number of dental issues. It surely is a sign of gum disease. On the other hand, tooth injury or infections can also lead to gum bleeding. This article provides information on the causes and treatments of gum bleeding. Many patients won’t know until the condition becomes severe because gum disease isn’t painful most of the time. When you are aware of the signs of gum disease, you can detect the condition in its early stages. That way you can easily reverse the condition through the proper gum disease treatments. Bleeding is the first sign that signals gum disease. Sometimes, bleeding will be accompanied by tenderness, red swollen gums, tooth sensitivity, and bad breath. Bleeding accompanies by receding gums is also considered a symptom of gum disease. Medical issues such as diabetes, leukemia, heart conditions or scurvy. That is why you should visit a qualified dentist to diagnose the condition correctly. In fact, self-diagnosing can become a problem at times. Hence, it is best that you don’t self-diagnose the condition but visit a professional healthcare provider as soon as possible. Only a professional dentist can diagnose the real cause of bleeding gums and recommend the right treatments for the condition. The most effective gum disease treatment is to remove the plaque from your teeth. Plaque is a kind of bacteria that causes gum disease over time. When dental plaque builds up, it turns into a hard sticky substance that sticks to your teeth. This is known as tartar. 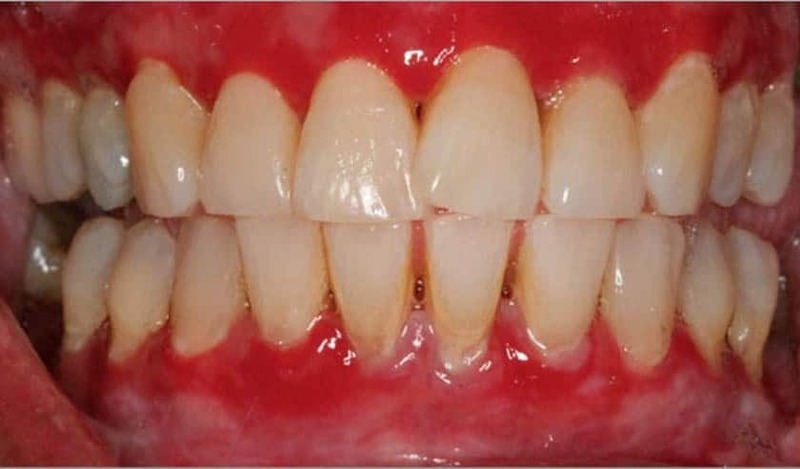 Tartar can lead to gum disease over time when you don’t clean the teeth properly. You should see a dentist as soon as you notice bleeding gums. This will help prevent the disease developing into gingivitis and periodontal disease in the long run. In fact, root planing and scaling can help slow down the process of gum disease. If you suffer from advanced gum disease, your dentist will recommend periodontal therapy or dental surgery to control the issue. Brush properly with a soft toothbrush. Brush for 2 minutes twice a day, especially after meals. Floss once a day. Make sure to floss beyond your gum line to get rid of more plaque. Use a cold compress in the area to control bleeding. Use salt water and hydrogen peroxide to rinse the mouth in order to keep the region clean. Tobacco will aggravate gum bleeding. Limit sugar and carbohydrates foods and eat a balanced meal. An oral irrigation device is the best tool to clear debris from above the gum line. Have your dentures aligned when required. The above read offers information on the causes and treatments of gum bleeding.